Monbiot – another cog in the wheel, it turned out – made two big errors in that sentence. First, he made the same immediate mistake that Desmogblog’s James Hoggan made about Oreskes right at the front of his book. She is a science historian, not an actual scientist. 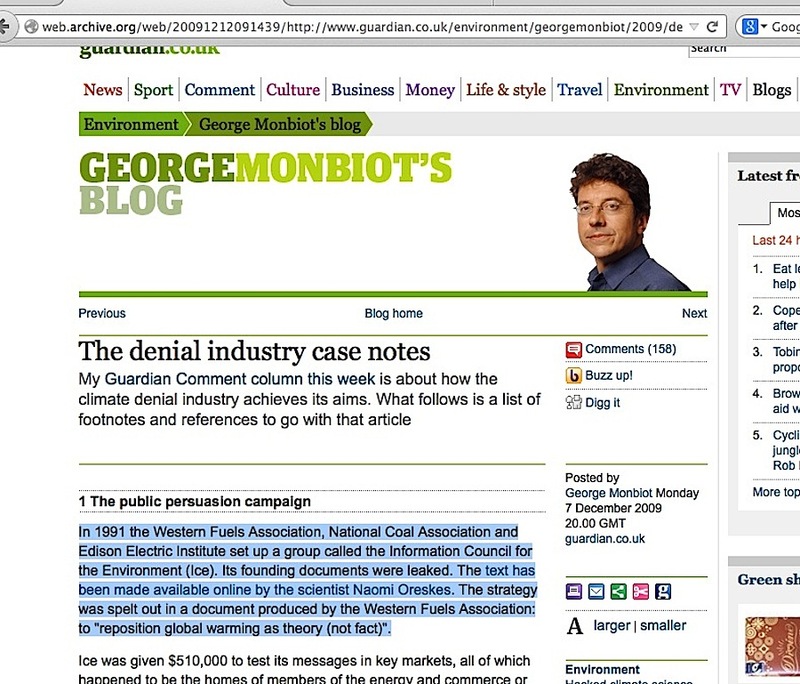 More egregious though, Oreskes did not place the memos anywhere online in their full context, the link in Monbiot’s article merely goes to Oreskes’ 2008 PowerPoint presentation, which, as I have pointed out a couple of times within my blog, shows no more than a single out-of-context page of Western Fuels’ ICE campaign, and she cites Ross Gelbspan as the source for it. Monbiot’s citation of Oreskes was a dead-end for the ICE memos, and unlike the tobacco industry’s infamous 1969 Brown & Williamson “Doubt is Our Product” strategy memo which is found in its full context within mere minutes on the internet, I did not find the ICE memos until early May 2010…. and that was only because I finally made the connection of Ozone Action to Greenpeace USA. A search of Greenpeace archives turned up their incomplete ICE memos set in short order. 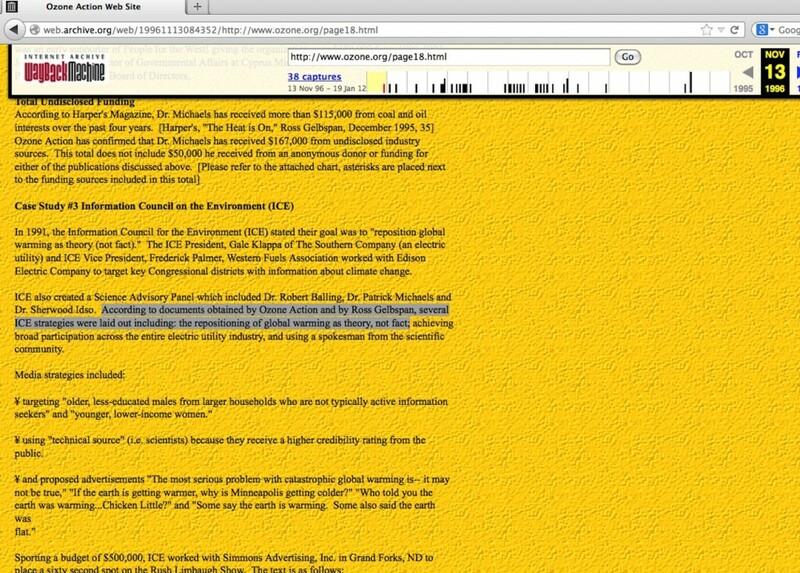 As I pointed out in my 6/10/13 blog post, nobody said outright that Greenpeace had those memos, not even Oreskes. 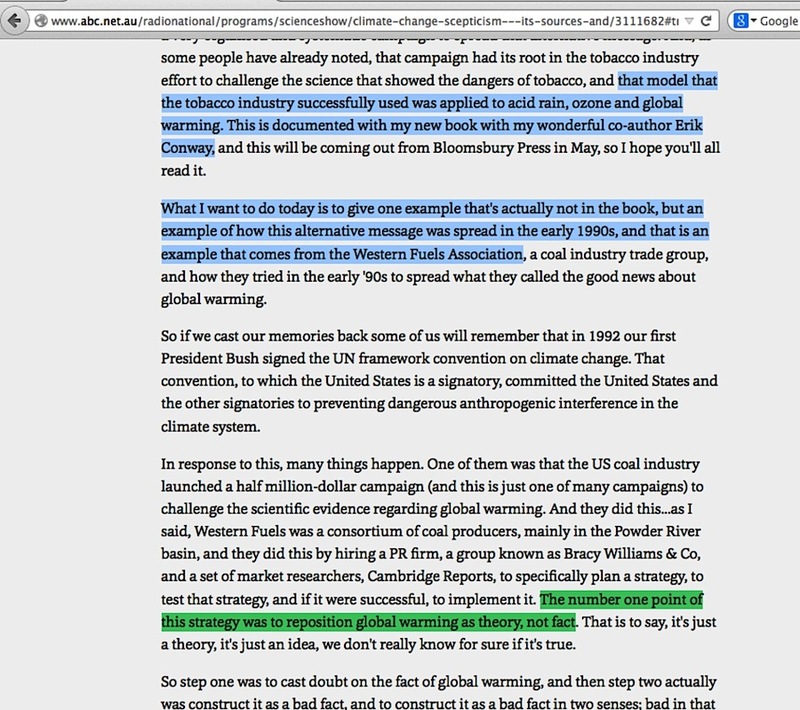 Oreskes’ “Merchants of Doubt” Chapter 1 is titled “Doubt is Our Product”, where she goes to great length within it to make a guilt-by-association accusation that skeptic climate scientists are employing the same “Tobacco Strategy” tactic, citing the “Doubt is Our Product” memo directly on page 34 as a wrap-up for the chapter. 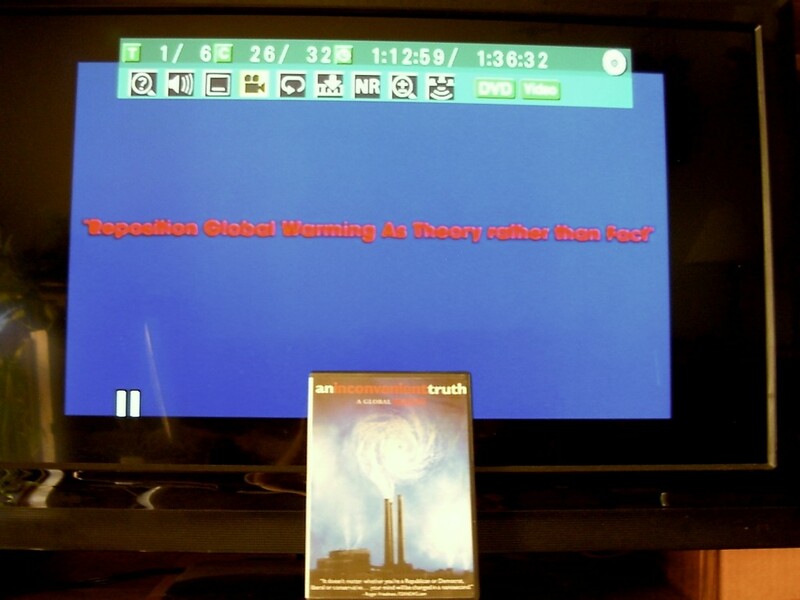 Al Gore cited that same tobacco company memo in his 2006 “An Inconvenient Truth” movie, right before he spelled out the “reposition global warming as theory rather than fact” phrase full screen. Within the main text of Oreskes’ book, however, she only makes a brief mention of Gelbspan on page 246, lumping him in with others who themselves only cite him as their source when accusing skeptic climate scientists of industry corruption. She never mentions Gelbspan’s favorite ICE memo “reposition global warming” phrase anywhere in her book. How odd. Without that ICE phrase, her book does no better than insinuate illicit money buys skeptic climate scientists’ viewpoints, while not even making any effort to back this up with hard evidence of a quid pro quo arrangement between skeptics and industry. 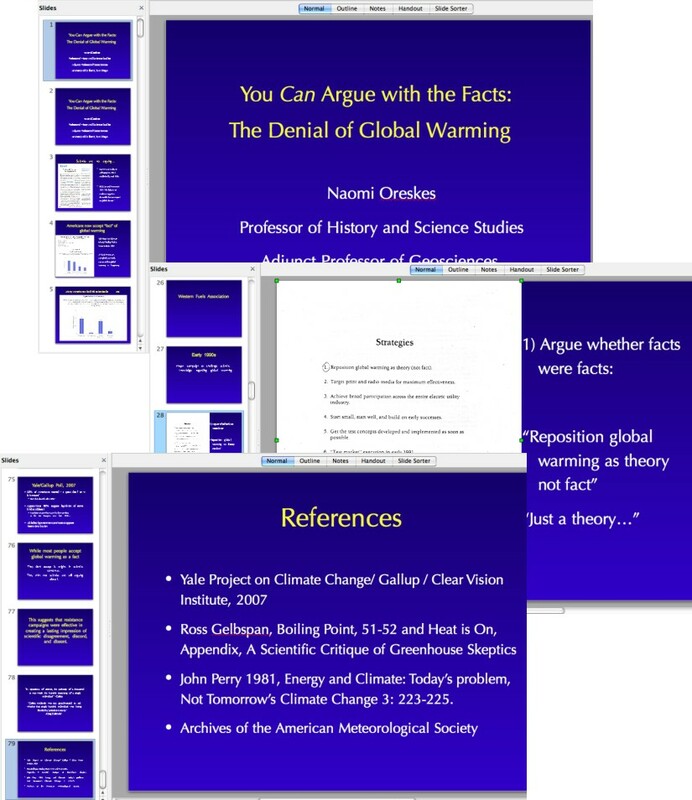 … The number one point of this strategy was to reposition global warming as theory, not fact. Yawn. Same old repeated talking point accusation based on an out-of-context phrase from a set of documents that everyone except me is seemingly afraid to show. What sets Oreskes apart from other repeating Gelbspan’s accusation is not what she repeats, but is instead what she says about the ICE memos and people having a direct association with the memos after they were leaked. Unlike all the other people who just repeat what is fed to them, Oreskes is among very few people who give indications that they’ve seen the ICE memos firsthand after they were leaked – less than ten others by my count so far. Thus the need for future blog posts on Oreskes’ involvement. Leaked memos serving as really questionable evidence for harsh accusations don’t just fall out of the clear blue sky onto obscure science historians. From what I’ve found, Oreskes had at least one unguarded moment where she unwisely disclosed details surrounding the memos**, a situation that may potentially sink the entire accusation. However, the details of that situation will have to wait until later. 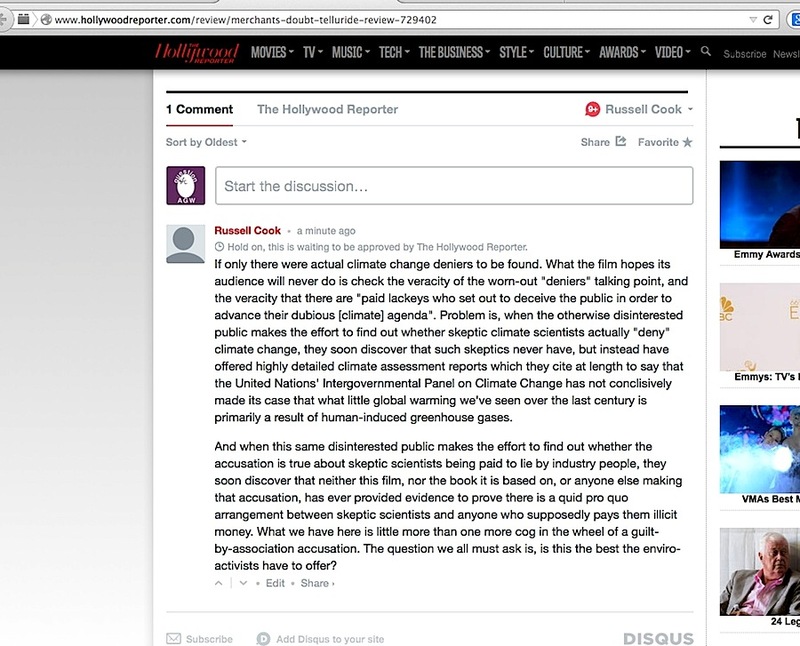 This entry was posted in Tobacco Industry Parallel and tagged ICE, Monbiot, Naomi Oreskes, Western Fuels Association by Russell Cook. Bookmark the permalink.